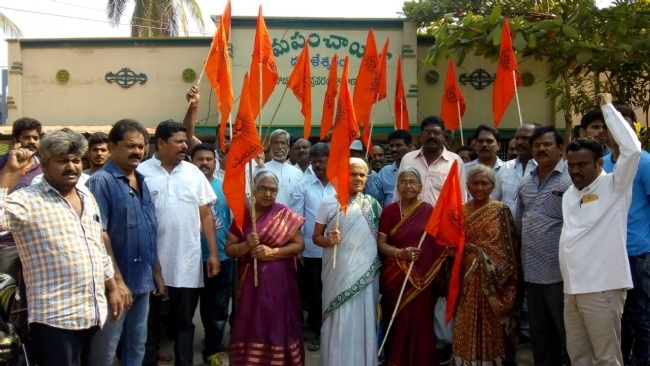 Hindus in Andhra Pradesh today are wondering if they even have the right to remain as Hindu given the kind of support and means the evangelists are employing to convert gullible Hindus. Pushkar ghats on the banks of the mighty river Godavari is one of most sacred venues for Hindus south of the Vindhyas. Hindus pay obeisance to Godavari by taking a dip, and Pushkarams held once every 12 years are most sacred. But today the evangelists are not even sparing this sacred venue of the Hindus and are using it further their conversions with tacit support from a section of the police and the administration. Rabid Christian evangelists are using various means to convert Hindus and using the Pushkar Ghats for their baptism ceremonies. Their activities have increased in the past few weeks. Concerned Hindus who found this out raised strong objection last week for bringing harm to the sanctity of the ghats. This has led to repeated arguments between the Hindus and those who support conversion activities. But the strong reprisal from Hindus led to a temporary halt to the conversion activities on the ghats in November. This was only temporary relief as the real problem started then on. Evangelists came back with support from few officials. Hindus who objected to the conversions were slandered as communal activists. Shocked Hindus are asking if objecting to desecrating their sacred river and ghats which they consider as their mother is unlawful. 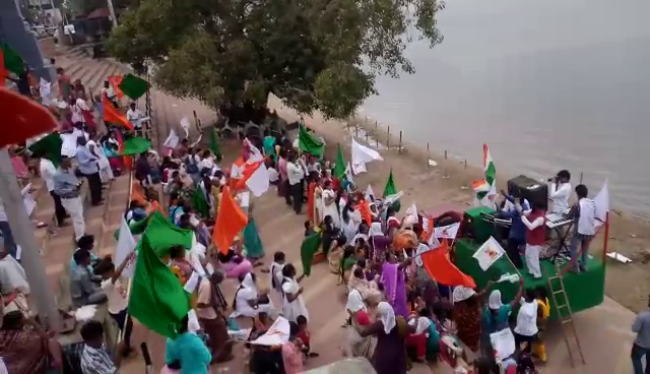 One of the protesters says, “If such activities which use our sacred river as a tool for conversion is allowed, should the Hindus vacate their homes and not even object. Each Hindu remembers all the major rivers in the country while bathing also while reciting shlokas. Rivers are not just a source of water but are considered as mother, a deity, and this is our heritage. Rivers have their importance from birth to death in a human beings life and even later. As per Hindu traditions, many festivals like pushkarams are conducted on river banks. Hindus believe that bathing in sacred rivers during Puskarams will absolve them of their sins. Given the importance Hindus accord to the rivers, disrespecting their beliefs has angered all Hindus here”, he says in a concerned voice. Hindu organisations have resisted attempts to misuse the ghats and have even petitioned the panchayat. But the evangelists are taking the help of certain authorities who are helping them to use the ghats for conversion activities. Members of the Church and supporters of Evangelists have been targeting the Hindu organisations and leaders using the official machinery. A Circle Inspector close to the Christian leaders, is accused of acting as a facilitator for the Evangelists than as a maintainer of law and order. Further, the Hindu activists allege that the CI castigated the Hindu activists who are protesting at the ghats and threatens that he would foist SC/ST atrocity cases against them if they continue to hinder the activities of the Christians. With political support, the authorities are persuading the Hindus to make way on one Ghats for the Christians. But all Hindu organisations are opposed to any such move to desecrate the holy ghats. On November 27, the Sub-Collector of Rajahmundry had called for a compromise between Hindus and Christians which the Hindus boycotted as the Christians have no business in the matter related to the faith of Hindus. Shyam of VSK Andhra informed Organiser that they had been receiving the news of conversions from Pushkar Ghats for last few weeks and they are aware of the ploy of the Evangelists. “When Hindus first complained, the missionaries stopped but a few days later moved to another ghat. When they were stopped there too they moved to yet another ghat. Now they have understood that Hindus won't stay quiet and hence are using their influence in the administration to syphon off the ghat. This is the reason why Hindus did not participate in the sham meeting called by the Sub-Collector on 27th and continued to protest against their idea of giving away a ghat for Christians”, he informs. - Perhaps this is the first time in India that the Government decided to allocate a separate Ghat for Baptism process which is a part of Religious Conversion Ceremony. - Before that we would like to know the actual reasons for these massive conversions. In a group, no two persons feel hungry at a time, and no two persons think similar. But how the people are getting converted at a time in large scale? Did the government try to find the reality behind it? - Is there any Mechanism adopted by the Government to trace the details of the people who are getting converted to other religion? - Is the government having the details of the Pastors who are demanding separate Ghat for massive conversions? Which church do they represent? - Did the Government verify whether their Churches are having proper permissions? - How many people were convened by the above pastors who are demanding a separate Ghat for Baptism? Are there any records maintained by the government? - Are the above pastors giving certificates to the people who got convened to Christianity? My information with the Government on this? - How many people from the SC Category were converted to Christianity and obtained BC-C certificates? Are Government authorities properly following these norms? The representation further says that conversion from Hinduism to Christianity is not just changing the religion and it is a matter of National Integrity, threat to Communal Harmony and to National Security. The petition also wonders if the Union Ministry of Home Affairs is aware of the ongoing things in Rajahmundry. Legal experts opine that neither the Collector or the Sub-Collector have the legal authority to give away the sacred ghats to the Christians. These are also the questions the Hindus have been raising ever since the ghats have been misused. Hindus now expect the district administration to answer the questions raised satisfactorily. By turning the protests into a Dalit and Non-Dalit issue, the Evangelists and their supporters are trying to play a deadly game and provoke people. However, the protests last week have awakened the Hindus and many are now aware of the ploy of the Evangelists in trying to turn their failed attempts at conversion into a Dalit issue. A Hindu leader says, “The Christians who are involved in conversions in the ghats have tried to turn it into a Dalit issue and claim that the ‘Savarna’ Hindus are not allowing them to use the ghats. This is completely untrue as our protests are only against conversions and all Hindus irrespective of caste and creed are using the ghats for ages. This Christian ploy will fall flat”, he says confidently. The Dalits themselves are now realising this, have called out the conspiracy of the Evangelists and many now are part of the protests against the illegal use of ghats for conversions.